Interesting regular folks with different backgrounds and perspectives talking about sports, politics, religion, business and more. We cover all the things you aren't supposed to talk about in a fun respectful way while throwing in entertaining guests and segments. Yiddish word of the week, No You Dii'nt and "Defending the Millennial's" are just a few of our favorites. The show starts welcoming back Tracie. More Millennial comparisons to the cast. 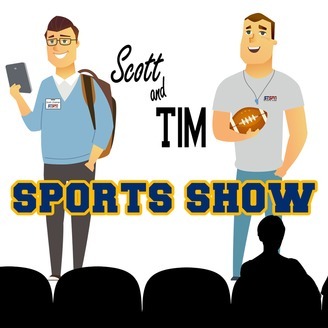 Covered some sports, Russ’s big contract, Mariners most win in baseball and more. Some awesome News from Fernalicious, Yiddish Word of the Week with David Neuman. “Chief of Nothin’s stop by the show.Tracie Jansen’s talks about her big one thing. Logan of Public Theatre hangs out and talks about the song, “Elevate” finishing with “No You Di’nt”. Huge Shout Out to our great sponsor, Foundry Men’s Goods! Check them out online at https://www.foundrymensgoods.com/ and use PROMO CODE POD15 to get 15% off. And welcome Aura Frames, check them out at https://auraframes.com/ use PROMO CODE SOMETHIN50 to receive $50.00 off your new cool digital Aura Smart Frame! Featured Music by Public Theatre “Elevate” available now on Spotify, iTunes, Bandcamp.com and everywhere you get music. Available on iTunes, Spotify, Souncloud and wherever you get music. Recorded at Fred’s Rivertown Alehouse in downtown Snohomish, WA. 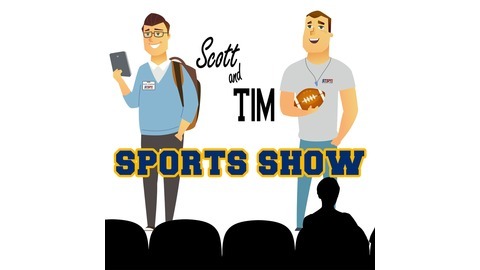 "Scott & Tim Sports Show"